"It's not about his past." 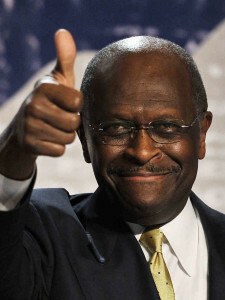 Whatever…… Let's see if he sticks to that position and votes against Cain. My guess is that Trump doesn't go through with the nomination. Cory’s holding out for Roger Ailes? Bill O’Reilly?? . . .
Gardner may be opposed now (. . . who can ever tell for sure when all you’ve got to go on is what he says? . . .), but after tRump says “jump,” you can bet he’ll be plenty posed! Remember that $rump is a reality TV producer. He knows drama, and psyching his audience out with plot twists and fake outs. So we got truly awful and incompetent acting AG Whittaker before we got the seemingly competent and experienced AG Barr. And Barr is now showing himself to be utterly unprincipled, throwing around accusations of spying and treason against the very intelligence agents who exposed $rump’s treason, and the spying of his foreign allies against our democracy. So I expect that the clownish Cain is just an appetizer, comic relief for the Shakespearean tragedy with the pile of bodies at the end, someone we can (as $rump’s captive audience) be relieved about when he doesn’t get the job, when the lethal (but smooth talking, “professional” seeming ), scorpion ultimately lands the position. I wonder if anyone has told Trump there is no such thing as an "acting" Federal Reserve Governor?
. . . he just learned today who Washington DC was named for? Perhaps the state out West. He has to hate Washington at least a little. He's McCain's cousin.